Thomas Angus Ranch The Brand That Covers the West! We are located in the beautiful Baker Valley of Northeastern Oregon and just a short two-hour drive from the Boise, ID airport. Thank you for taking time to visit our program. We look forward to introducing you to the people behind the brand and to the tradition and history of Thomas Angus Ranch. Few programs in the world can attest to a 100% AI program. We are confident in our past success and our continued success. It is humbling to have our genetics working in these elite programs and to see Thomas Angus Ranch genetics adding value to the purebred Angus business. 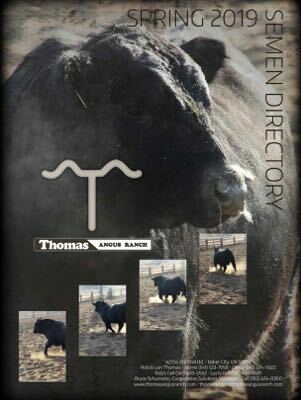 At Thomas Angus Ranch we offer an unconditional guarantee on every bull and female we sell. We also realize the importance and trust that you place in us to provide data and information to you that will assist you in your genetic decisions and selections. In the end, our success lies 100% with your success; therefore, we make every effort to assist you in bull and female purchasing decisions from Thomas Angus Ranch. Many of the country's most progressive and elite Angus breeders have added Thomas Angus Ranch genetics to their programs. It is humbling to have our genetics working in these elite programs and to see Thomas Angus Ranch genetics adding value to the purebred Angus business. We would encourage you to contact any of these breeders to discuss how our genetics have worked for them and how they might work for you.